A recruitment event by Uber at the University of Toronto this week began as a lecture and ended like a celebrity sighting. 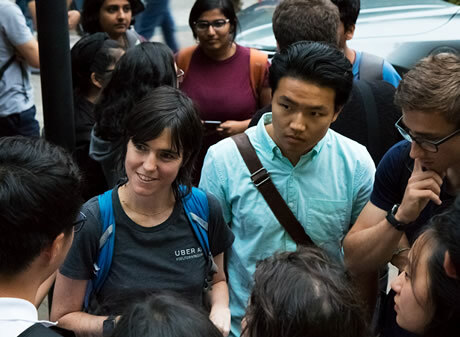 Raquel Urtasun, the head of Uber’s new self-driving vehicle lab in Toronto, was engulfed by dozens of eager, resumé-clutching students immediately following a presentation about her research at the ride-sharing giant. The scrum occurred shortly after Urtasun, who is also an associate professor of computer science at U of T, told the packed auditorium to head outside to see one of Uber’s sleek, gun metal-coloured test cars, complete with a spinning sensor array strapped to the roof. She only managed to walk about 15 metres before she was surrounded – one of the many ways Urtasun’s life has changed since she was named head of Uber Advanced Technologies Group Toronto earlier this year. “My life has become much busier,” Urtasun acknowledged in an interview prior to the event.